Large Tarot Bags - Celestial Nights Large Bag - Tarot Bags, Tarot Cards, Cloths, & More! 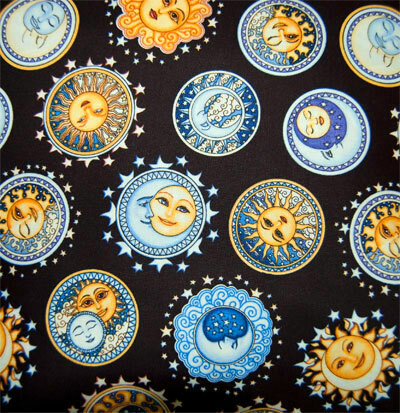 Bring a sense of hope, tap into dreams, and radiate joy with this Celestial Nights Tarot Bag. Orbs of smiling, friendly suns and dreamy, happy moons float against a midnight-black background. 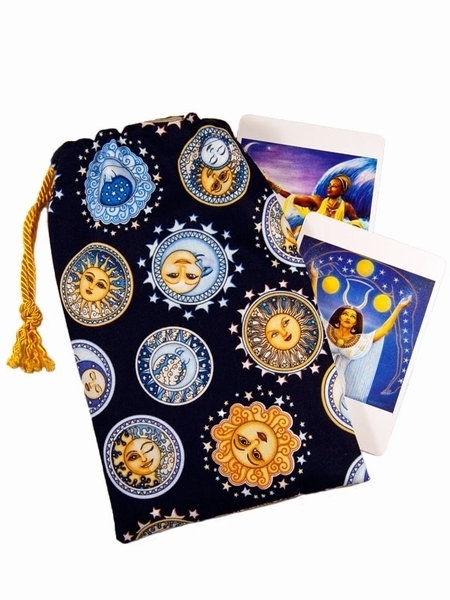 Because the sun, moon, and stars are all good for your cards this bag will give your tarot deck a celestial supercharge! Featuring circular vignettes of our favorite heavenly bodies, some adorned with a ring of stars, this bag depicts symbols of three Major Arcana cards: the Star, the Moon, the Sun. Deck Suggestions: Pictured with the Large Celestial Nights Bag are cards from The Goddess Oracle.. Size: Measures approx 6" wide by 10" inches tall (about 15.2 cm x 25.4 cm). Fits most large or oversized tarot or oracle card decks (up to 5" x 7") and small book.